A special service was held in St Egelwin's Church, Scalford for a very special lady. 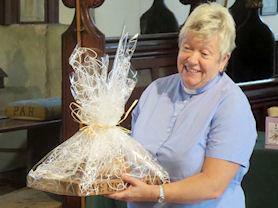 'Our Rev Bev' has decided to take well her earned retirement and will be leaving the parish in October. She has been a large part of Scalford C of E Primary School and has worked along side Headteachers and Governors for the past 12 years. We achieved Outstanding SIAMs status in 2015 and this would not have been possible without her guidance and support. The staff and Governors presented her with an oak bread board with an inscription from the Lord's Prayer together with home made bread from a family whose children attend our school. We wish both Beverley and her husband David a long, healthy and happy retirement.